Opponents of abortion rights gather at the Washington Monument to hear Vice President Pence speak at the March for Life rally on Friday. "I think we're a pretty different march — we're a one-issue march," said March for Life President Jeanne Mancini. The March for Life is also an annual event, held each year since the Supreme Court's Roe v. Wade decision legalized abortion nationwide. This year's march and rally come less than a week after the Women's March, which was organized on social media largely as a protest against President Trump's campaign rhetoric. While the marches in Washington and around the world focused on an array of issues including LGBT rights and the environment, reproductive rights were a major focus. Vice President Pence and presidential adviser Kellyanne Conway are scheduled to speak at the Friday rally. A statement from the March for Life pointed out that Pence will be the first vice president in history to speak at the march. That juxtaposition has opened up a larger debate about how women who consider themselves "pro-life" fit into the feminist movement. The issue became a point of tension surrounding the Women's March after a handful of anti-abortion activists said they were planning to attend. In a statement, organizers apologized for initially including the anti-abortion group as a partner, stating that the march's "platform is pro-choice and that has been our stance from day one." The group New Wave Feminists, a self-described "pro-life feminist" organization, was initially granted partnership status in the Women's March, only to have that status rescinded when it became clear that the group opposed abortion rights. Destiny Herndon-De La Rosa of New Wave Feminists said she was "certainly disappointed" but had "no hard feelings" about that decision. "The march on Saturday was AMAZING," Herndon-De La Rosa wrote afterward in an email to NPR. "I honestly can't begin to describe how wonderful it was. It was so positive, no negativity, so much support." Herndon-De La Rosa said she is also attending the March for Life in Washington. Another anti-abortion group, Students for Life of America, also wanted to have a presence at both marches, said President Kristan Hawkins. She said they walked with the crowds of women in pink hats carrying banners that read, "Abortion Betrays Women" and "We Don't Need Planned Parenthood." Hawkins said some of the marchers tried to block their banners at one point, but overall, "We had some really good interactions." For some abortion-rights supporters, there is room for disagreement on the issue among those who identify as feminists. Kristie Hewitt, 49, came to the Women's March from Lansing, Mich. She said she is worried about the potential for cuts to federal funding for women's health services at Planned Parenthood under the Trump administration. "I really believe in women's reproductive rights. I cannot quietly go back to the 1950s," she said. But Hewitt said she was OK with marching alongside women who disagree. "I think anybody has a place in this movement; we're all here for the same reason — women's rights — and I think there's a place for everybody," Hewitt said. "And we all need to sit down at the table and talk, and have a conversation as to what's the best for everybody." But in terms of policy, the disagreements are stark. Already, abortion opponents are seeing some of the actions they want from Trump and the Congress, including a presidential memorandum banning federal funding for groups overseas that provide or "promote" abortion. Other goals, said Hawkins of Students for Life, include cutting federal funding for reproductive health services at Planned Parenthood, which Hawkins said is "in the fight of their lives." "So it's even more important that pro-lifers are there, they show up, and they show this administration in Washington that we're paying attention," Hawkins said. 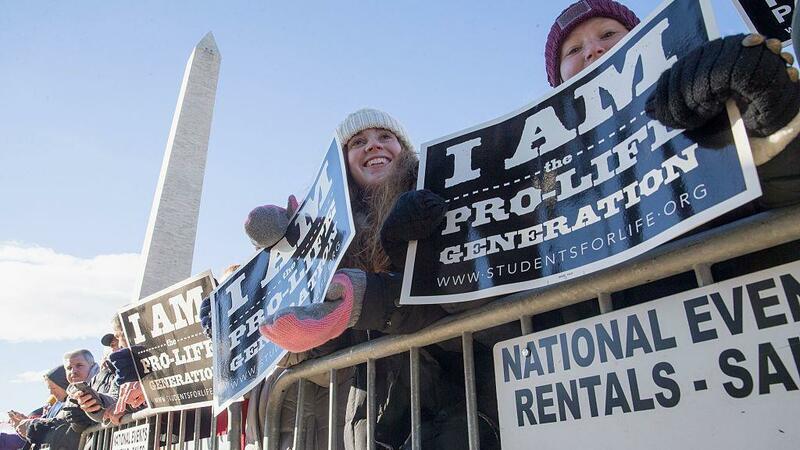 March for Life organizers are expecting "tens of thousands" of marchers in Washington, Mancini said, along with dozens of smaller, local marches being held around the country in the early months of 2017. The goal, she said, is to mobilize anti-abortion activists around the country to put pressure on elected leaders to carry forward their agenda. Mancini's top priorities include making permanent the federal ban on public funding for abortions and a ban on late abortions. State laws banning abortions after 20 weeks' gestation have been found unconstitutional in federal court. That's why a major concern for anti-abortion groups is to see Trump follow through on his pledge to social conservatives to appoint judges who align with their views. Trump has promised to announce his nomination to replace late U.S. Supreme Court Justice Antonin Scalia next Thursday, a move activists on both sides of the abortion debate will be watching closely. And I'm Steve Inskeep in Washington, where it's the day of an annual event, the day when thousands of people arrive in the city to attend what is called the March for Life. This year, opponents of abortion rights will hear from the new vice president, Mike Pence. NPR's Sarah McCammon is covering the march. She's in our studios. SARAH MCCAMMON, BYLINE: Hi, Steve. INSKEEP: How energized are activists this year? MCCAMMON: Well, they're feeling good about the Trump administration and especially about Mike Pence, who has a long history as Indiana's governor, of opposing abortion rights. He was sort of picked, in many ways, to shore up the confidence of social conservatives in Trump who, in the past, had described himself as very pro-choice, though he ran, you know, as an anti-abortion candidate. And so Pence is popular with this crowd. And they have a lot of things they're hoping for from this administration. MCCAMMON: Quite a few things. A big goal is to cut off federal funding for women's health services provided by Planned Parenthood. Federal funding for abortion is already not allowed. But a lot of these groups want to see Planned Parenthood sort of taken off of the list of groups that can provide services through Medicaid. INSKEEP: Because it receives federal funding at all for women's health services, even though the money doesn't go for abortions. MCCAMMON: Right. Other goals include a federal 20-week ban on abortion, something that has been tried in several states and found unconstitutional at the federal level. But that is why, Steve, the Supreme Court is really the big goal. President Trump is expected to announce a nominee next week, and that's something that anti-abortion activists are really watching. INSKEEP: What are you hearing from specific groups you've spoken with? MCCAMMON: So ahead of this event, I spoke to Kristan Hawkins of Students for Life of America, and she talked especially about defunding Planned Parenthood as a goal. KRISTAN HAWKINS: So they are going to be in the fight of their lives, and they're acting like it. They're doing everything they can to start the discussion to try to save their federal funding. So it's even more important that pro-lifers are there, they show up and they show this administration in Washington that we're paying attention. INSKEEP: ...Let me ask you, Sarah McCammon, how does this event compare with the last big march in Washington, which was just a week ago on Saturday, the big Women's March, where hundreds of thousands of people showed up? MCCAMMON: Well, you know, there probably will be comparisons between the two because they're happening so close together at the beginning of the Trump administration. They are very different events, though. The Women's March is, you know, a one-time event. Maybe there will be more, but it was sort of organized spontaneously, in many ways in response to Trump's campaign rhetoric, really focused on women's issues and women's rights but lots of other issues as well - immigration, for instance, and the environment, whereas the March for Life is an annual event. The only issue is opposing abortion - legalized abortion. Here's what the president of March for Life, Jeannie Mancini told me. JEANNE MANCINI: I was very sad because I think young women really missed out on a critical voice at the Women's March. And - but that said, I think we're a pretty different march. We're a one-issue march. INSKEEP: What does she mean by missed out on a critical voice at the Women's March? MCCAMMON: Yeah. So that brings us to some of the tension between some of the ideas that are being talked about today and were talked about last week at the Women's March. There was a bit of a controversy over whether or not anti-abortion feminists could participate. They weren't allowed to be official partners, but some of them did march last week and will be here today. INSKEEP: And they'll be marching again today. INSKEEP: That's NPR's Sarah McCammon this morning in our studios. Transcript provided by NPR, Copyright NPR.